Have you ever been asked a question that you could answer perfectly well but for some reason find yourself burbling a slightly incoherent answer and then kicking yourself for the rest of the day? I’ve just been asked (unexpectedly) by a major women’s publication, what does RenewYou actually do for women? I wish I could tell you I gave a coherent and quotable soundbite of a response, but I’ve got to be honest, I didn’t. RenewYou is so close to my heart, so much part of my passion for helping women, that I sometimes find it hard to be objective and so I burbled, hence bruised shins. “I’ve never had so much time to properly think about myself before in such a safe environment. The exercises are so insightful and it’s been really liberating to talk with the other women. I realise that for the last four years I’ve been on a sort of automatic pilot, doing what was expected of me without really stopping to think if it’s what I actually want. Your phrase ‘live your life consciously’ really struck a chord with me. I feel back in control. I’m going to retrain to follow my dream of working in the arts.” And she did. It’s one of the reasons I love RenewYou so much. I didn’t write it with the intention of it being life changing; that’s a happy outcome I hadn’t anticipated. I wrote it because when I was working one to one with wonderful, fabulous women privately they would confess to not feeling confident in their role. There are a plethora of surveys telling us that women’s lack of confidence stops then being high achievers. That last phrase is problematic in itself; what constitutes a high achiever? Is that somethings defined by a our largely male culture and underscored by amount of money earned? Is it something most women want to buy into? Are we women less confident because we’re being judged differently, or trying to succeed in a world where our gender was not taken into account? There are a myriad of reasons. My aim with RenewYou was simple: I wanted it to make women feel feel good about themselves at the end of the day, and to give them the confidence to be whatever they wanted to be. For some that is career advancement, for some it’s giving up a career and following a dream that might not confirm to the norm. To my knowledge it’s only once resulted in someone leaving her partner but if that’s what she needed to do, all power to her. And all power to you, too, in following your dream. Never give up; you may have to adapt and compromise from time to time but, if you know what you want, have a plan to get there, get support from those who matter, you will achieve it. Dare to dream! 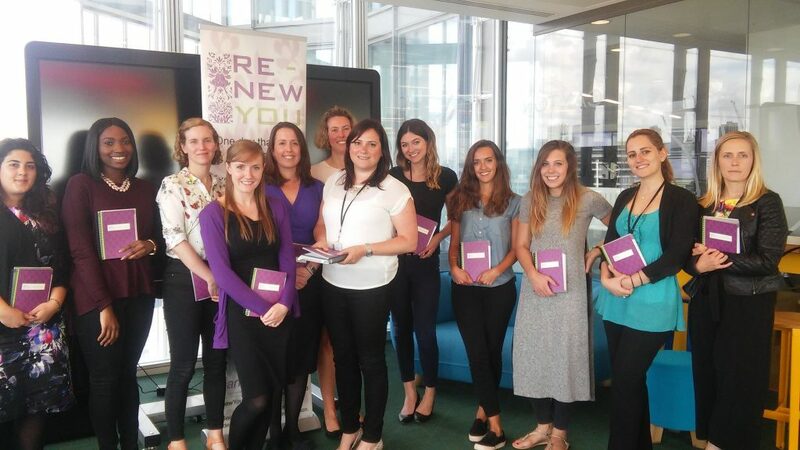 The photo above is of some journalists and staff at NewsUK who had an in house RenewYou in May this year.